Pastor uses the Bible to prove how God is using President Trump to help the nation. SAN JOSE, Calif., Feb. 13, 2019 /Christian Newswire/ -- Rev. 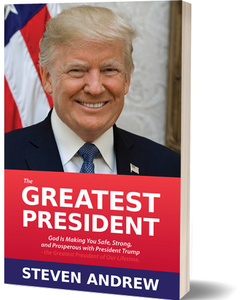 Steven Andrew has released his latest book called "The Greatest President: God Is Making You Safe, Strong, and Prosperous with President Trump - the Greatest President of Our Lifetime." In it he compares the Bible and the words of our founding fathers and how they apply to the presidency of Donald Trump. Andrew cites Trump's love of country and his constant striving to keep his promises, unlike most politicians. He shows the president's efforts to roll back the hateful anti-Christian and anti-Constitution rhetoric from previous administrations and discusses the president's executive order to minimize the Johnson amendment that stifled political discussion in churches. He discusses Trump's rejection of Globalism in favor of a strong America and then goes into a list of the president's accomplishments in restoring our economy, including fostering fair trade and cutting red tape. Andrew quotes passages from the Bible that show "Turning away from God causes disfavor and economic downturns" and honoring God leads to prosperity. "We observe God working through President Trump in many other ways to make the USA strong again, such as uniting people in American values, rebuilding the nation's infrastructure and military, calling for respect of the USA's flag and opposing communism and tyranny," Andrew said. He talks about the Biblical foundation for compassion for the unborn, and the need to overcome terrorism and secure our borders. Andrew concludes with a discussion of why pastors all over the country should tell their congregations how President Trump is helping Christians. Andrew says, "An amazing thing is happening; as people reaffirm covenant that the USA serves the Lord, God works through President Trump! If you want to keep 'winning,' then this book is for you!" "The Greatest President" is available in a special, keepsake color paperback (ISBN 9780960014903) and ebook (ISBN 9780960014910). STEVEN ANDREW, an inspirational pastor, has reached over 80 million people for Jesus Christ. He follows in the steps of the founding fathers by leading the USA to reaffirm covenant with God to save the nation. Andrew leads One Million Americans on the Lord's Side, with America's top Christians. To save millions of lives, he works with Christians and pastors nationwide and teaches God's answers to life's most perplexing challenges.